It’s National Volunteer Week this week, so Vinnies are here to hit you with 10 reasons why rolling up your sleeves and getting involved in your community today will change your life. We swear we're not making this up! Studies have found that focusing on other people's problems rather than your own has a number of benefits. Your stress levels start to decrease, your immune system is strengthened, and your overall sense of life satisfaction increases. This is because helping someone else interrupts tension-producing patterns and replaces it with a sense of purpose, positive emotions, and high confidence levels. Sounds like a win-win to us! 2. You'll make great friends. Volunteering lets you meet people from all walks of life outside your usual circle. You could meet your new best friend, future business partner, or have a conversation that sparks a real change in your life! 3. It's great for your community. Volunteering gives you the chance to shape the kind of community and world you want to live in. It gives you the opportunity to be part of something bigger than yourself and use your civic responsibility for the greater good. 4. It will boost your career and CV. Did you know volunteering is an awesome way to boost your career prospects? It helps you create a positive impression, makes you more innovative, creative and gives you a range of useful skills. It's not just us that believe this, recruiters do too! Potential employers give brownie points to job applicants who are motivated and community-spirited enough to be volunteers. 5. Giving back adds purpose to your life. Volunteering will make a difference in your own life too! It may sound cliche, but volunteering gives you the opportunity to give something back and feel good. There's nothing better than knowing that you're helping to creative a positive change in the world. As a bonus, volunteering opens you up to new areas of interest you may never have considered before! 6. You'll learn and share your knowledge. Forget what you think you know! Volunteering will mean learning how to adapt your way of thinking. You'll meet and chat to people you might usually, and broaden your mind to learn about the everyday struggles faced by others. At the same time, sharing your own skills and passions will inspire others. 7. You'll put your time where your mouth is. Want a more meaningful way to fill your time than binge watching Netflix? Now's the time to take action! Our wide range of volunteer programs are flexible with all commitment levels and we can work with your timetable. We're grateful for whatever time you can spare! 8. You can pursue tasks that you're passionate about. Vinnies has so many different types of volunteering opportunities, so your reason for volunteering can begin where your passions lie. That way all the hard work will be worth it, you'll be more committed to the cause and as a result, your impact will be that much bigger. 9. You'll become part of the Vinnies family. We love each and every one of our volunteers! Volunteering with Vinnies gives a real sense of fellowship in a wholly supportive environment. People from all walks of life are welcome! We're so full of gratefulness that you're willing to help and volunteer your time. 10. It's heaps of fun! Of course, volunteering is not something to take lightly and needs to be treated with the utmost respect, but it's also fun! With hard work comes a lot of good times and laughter. It's a reason to meet new people and embrace new experiences. Combining this with all the selfless reasons to volunteer, makes for an unforgettable adventure which will stay with you for the rest of your life. 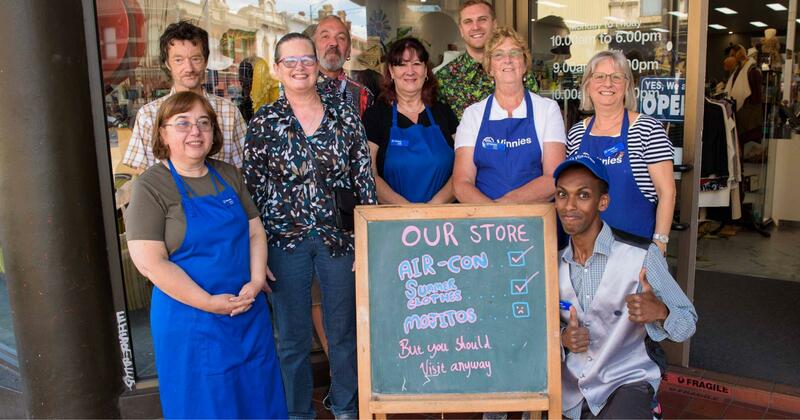 Vinnies has 12,000+ volunteers across Victoria. They're in our shops, on our streets, serving in peoples' homes, educating our youth and lending their ears to listen and provide companionship. During National Volunteering Week, we pause to say thank you for all the good our volunteers bring to the world. If you'd like more information on volunteering, please click here.